Tomorrow – Saturday August 29, 2009 Formula DRIFT co-founder Ryan Sage will be on BlogTalkRadio.com w/ host Gary Keith at 10 AM (PST). Be sure to log in and check it out. LONG BEACH, Calif. – August 27, 2009 – Formula DRIFT will debut the start of their comprehensive programming schedule on VERSUS this weekend. Formula DRIFT content will be made available in more than 75 million U.S. homes. The seven-stop Formula DRIFT Championship Series programs will air over fourteen Sundays during the 2 PM (EST) / 11 AM (PST) time slot beginning this Sunday, August 30. The first episode features a comprehensive overview of the sport and drivers. Viewers will then experience Round 1 “The Streets of Long Beach” and all of the events leading up to the final episode showcasing the Formula DRIFT Championship Finale from Irwindale, California on November 29. Each episode will showcase all the on- and off-track action as the world’s top drift drivers battle for the coveted title of Formula DRIFT Champion. The Formula DRIFT Pro Championship Series will be featured in HiDef and will focus on all the head-to-head action, technology, equipment and the personalities and behind-the-scenes drama. Check your local listings or visit the Formula DRIFT website at www.formuladrift.com for more information. It’s about that time of the year again! 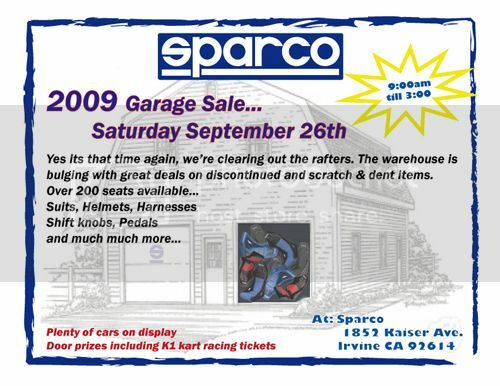 Sparco USA is having a sale, come for some great deals on discontinued items, helmets, shoes, and much more! Check out these 2 videos that give great insight on two of the top Formula DRIFT drivers with veteran drifter Daijiro Yoshihara stepping into his 5th drift car and back into the driver’s season of a Nissan S13, after his crash of the Lexus at the last event and Round 6: Locked and Loaded winner Stephan Verdier on his first ever drifting victory. Long Beach, Calif. – August 22, 2009 – Formula DRIFT returned to Infineon Raceway for Round 6: Locked and Loaded joining the Indy Grand Prix of Sonoma weekend. Stephan Verdier in the Cooper Tires / Crawford Performance Subaru STI takes his first victory in Formula DRIFT competition. Round 6: Locked and Loaded was the first event in Formula DRIFT history to share the same weekend with IndyCar for the Indy Grand Prix of Sonoma. Fans were treated to both drifting and open wheel racing action for an exciting combination of motorsports that kept everyone entertained. 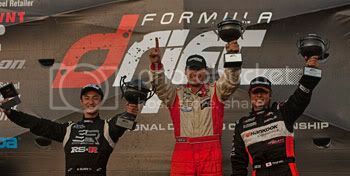 Current Formula DRIFT champion Tanner Foust in the Rockstar Energy Drink / Hankook Scion Racing TC battled against Hankook teammate Ryuji Miki in the APEXi / Hankook Mazda RX-7 for third place and after 2 hard fought One More Time battles Miki finds the podium once again. The final round had Ken Gushi in the RS*R / Scion Racing TC and Stephan Verdier battle for the top spot. On the first run of the final battle, Ken Gushi ended his run with a blown motor forcing him to take a bow and give Verdier the victory.